Help your favorite cause and earn cash back. Apply now. For every new qualifying account, and on each anniversary of qualifying accounts, Bank of America helps support the National Trust. Open your account today. Shop at AmazonSmile and Amazon will donate a portion of your purchase to the National Trust. Get started. 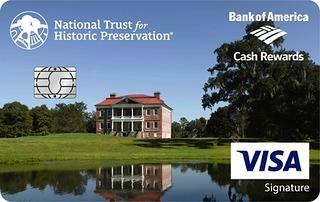 The National Trust for Historic Preservation is also a participant in the Amazon Services LLC Associates Program, an affiliate advertising program designed to provide a means for sites to earn advertising fees by advertising and linking to Amazon.com. NTIS is the nation's leading insurance agency specifically designed to offer comprehensive insurance solutions to historic property owners and preservation organizations. Contact NTIS to learn more about protection for your historic home. For nearly 50 years, National Trust Tours has been the trusted authority on group cultural heritage travel experiences worldwide. Historic Hotels of America includes 275 historic hotels that have faithfully maintained their authenticity, sense of place, and architectural integrity. Special discounts are offered for National Trust members.